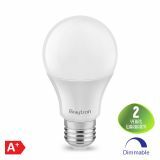 LED bulb 5W, E27, G45, 220VAC, 400lm, 3000K, warm white, golf ball, mini globe, BA11-00520 Mini LED bulb (golf ball) G45 from Braytron with E27 base, power 5W, brightness 400lm and gentle, warm wihite lighting. 35W replacement. LED bulbs are eco-friendly, efficient and offer lower power consumption. A+ energy rating. Extra wide beam angle. Non-dimmable. For indoor use only IP20. Manufacture warranty 2 years. 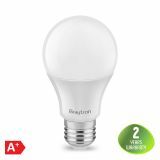 LED bulb 5W, E27, G45, 220VAC, 400lm, 6500K, cool white, golf ball, mini globe, BA11-00523 Mini LED bulb G45 from Braytron with E27 base, wattage 5W, brightness 400lm and cool wihite lighting. 35W replacement. LED lamps lasts longer and offers better light quality compared to traditional bulbs. Instant start. A+ energy rating. Non-dimmable. For indoor use only IP20. Manufacture warranty 2 years. LED bulb 5W, 220VAC, A55, E27, 400lm, 3000K, warm white, BA13-00520 5W LED lamp Braytron with E27 base, flux 400lm and soft, warm white lighting. LED technology is the most innovative and ecological lighting solution whic offer 80% lower power consumption compared to incandescents bulbs. Instant start. Non-dimmable. For indoor use only. Manufacturer warranty 2 years. LED bulb 5W, E27, A55, 220VAC, 400lm, 6500K, cool white, BA13-00523 5W LED lamp from Braytron with E27 base, flux 400lm and bright, cool white lighting. LED bulbs offer up to 80% lower power consumption compared to incandescents bulbs and save you electricity cost. Non-dimmable. No flicker. For indoor use only. Energy class A+. Manufacturer warranty 2 years. 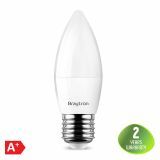 LED bulb 5W, E27, C37, 220VAC, 410lm, 3000K, warm white, candle, BA09-00520 LED lamp (candle) with E27 base and wattage 5W from Braytron with gentle, warm white lighting and light output 410lm. LED bulbs offer up to 80% lower power consumption compared to traditional incandescents bulbs. Energy class A+. No dimming. For indoor use only. Manufacturer warranty 2 years. LED bulb 5W, E27, C37, 220VAC, 410lm, 6500K, cool white, candle, BA09-00523 LED lamp (candle) with E27 base and wattage 5W from Braytron with cool white white lighting and luminous flux 410lm. LED bulbs offer up to 80% lower power consumption compared to traditional incandescents bulbs. Energy class A+. No dimming. For indoor use only. Manufacturer warranty 2 years. 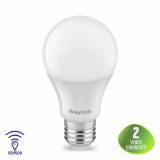 LED bulb 7W, E27, G45, 220VAC, 560lm, 3000K, warm white, golf ball, mini globe, BA11-00720 Mini LED bulb (golf ball) with E27 base, wattage 7W, luminous flux 560lm and gentle, warm wihite lighting. LED lamps lasts longer and offers better light quality compared to traditional bulbs. Instant start. No UV and IR radiation. No dimming. For indoor use only. Manufacture warranty 2 years. LED bulb with sensor, 7W, E27, A60, 220VAC, 470lm, 6500K, cool white, BA14-50723 LED lamp with sensor from Braytron with wattage 7W, luminous flux 470lm and cool white lighting. Built-in PIR sensor adds extra electricity savings because the lamp turns on only when a motion is detected. No dimming. For indoor use only. Energy class A+. Manufacturer warranty 2 years. LED bulb 8W, E27, A60, 220VAC, 650lm, 6500K, cool white, BA18-00823 Universal LED bulb A60 with base E27, wattage 8W, luminous flux 650lumens and bright, cool white lighting. Equivalent to traditional bulb up to 50W and it suitable for lighting at home, office, stores. Long lifespan up to 25 000h. Instant start. No flicker. For indoor use only. Non-dimmable. Manufacturer warranty 2 years. LED lamp 8W, E27, А60, 220VAC, 600lm, 6500K, cool white, emergency, BA14-30830, rechargeable Rechargeable 8W LED emergency lamp from Braytron with luminous flux 600lm and bright, cool white lighting. LED bulbs offer up to 80% lower power consumption compared to incandescents bulbs. Working time without electricyty 3 hours. For indoor use. No flicker. Non-dimmable. Manufacturer warranty 2 years. 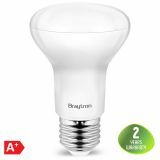 LED lamp 9W, E27, R63, 220VAC, 780lm, 3000K, warm white, BA34-00920 Universal LED bulb from Braytron with 9W power, E27 socket, type R63, 780lm luminous flux and soft, warm 3000K light. Suitable for residential, office and commercial lighting. Analogue to traditional reflector lamps up to 60W. Long useful life up to 25 000 hours. Energy class A +. Not dimmable. LED lamp 9W, E27, R63, 220VAC, 780lm, 6500K, cool white, BA34-00923 Universal LED bulb from Braytron with 9W power, E27 socket, type R63, 780lm luminous flux and bright, cool white light 6500K. Suitable for residential, office and commercial lighting. Analogue to traditional reflector lamps up to 60W. Long useful life up to 25 000 hours. Energy class A +. Not dimmable. LED bulb 10W, Е27, A60, 220VAC, 806lm, 3000K, warm white, BA13-01020 Universal 10W LED bulb Braytron with base E27, flux 806lm and soft, warm white lighting. Equivalent to 60W traditional bulb. Suitable for residentital buildings, hotels, restaurants. For indoor use only IP20. Non-dimmable. No flicker. Energy class A+. Manufacturer warranty 2 years. LED bulb 10W, E27, A60, 220VAC, 806lm, 4200K, natural white, BA13-01021 Universal and efficient LED lamp from Braytron with E27 base, 10W wattage and delivering 806lm(lumens). It offers natural white lighting (daylight) suitable for both residential and business buildings. Equivalent to traditional bulb with 60W wattage.Non-dimmable. Instant start. For indoor use only. Warranty 2 years. LED bulb 10W, E27, A60, 220VAC, 806lm, 6500K, cool white, BA13-01023 Universal and efficient LED lamp from Braytron with E27 base, 10W wattage and delivering 806lm(lumens). It offers cool white lighting suitable for both office and business buildings. Equivalent to traditional bulb with 60W wattage.Non-dimmable. Instant start. Energy class A+. For indoor use only. Warranty 2 years. LED bulb 10W, E27, A60, 220VAC, 806lm, 3000K, warm white, BA14-01020, dimmable Dimmable, LED lamp from Braytron with base E27 and flux 806lm. It offers gentle, warm white lighting suitable for residential buildings. Dimmable LED lamps should be used only with LED dimmers. For indoor use only. Instant start. No flicker. Long lifespan up to 25 000h. Manufacturer warranty 2 years. LED bulb 10W, E27, A60, 220VAC, 806lm, 4200K, natural white, BA14-01021, dimmable Dimmable, LED lamp from Braytron with base E27 and flux 810lm. It offers natural white lighting (daylight) suitable for all type of rooms. Dimmable LED lamps should be used only with LED dimmers. For indoor use only. Instant start. No flicker. Long lifespan up to 30 000h. Manufacturer warranty 2 years. 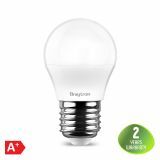 LED bulb 12W, E27, A60, 220VAC, 1055lm, 3000K, warm white, BA13-01220 Universal and efficient LED lamp from Braytron with E27 base, 12W wattage and delivering 1055lm(lumens). It offers warm white lighting suitable for home areas. Equivalent to traditional bulb with 85W wattage. Non-dimmable. Instant start. No flicker. Energy class A+. For indoor use only. Warranty 2 years. LED bulb 12W, E27, A60, 220VAC, 1055lm, 4200K, natural white, BA13-01221 Universal and efficient LED lamp from Braytron with E27 base, 12W wattage and delivering 1055lm(lumens). It offers natural white (daylight) lighting suitable for home and office areas. Equivalent to traditional bulb with 85W wattage. Non-dimmable. Instant start. No flicker. Energy class A+. For indoor use only. Warranty 2 years. 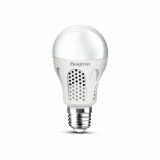 LED bulb 12W, E27, A60, 220V, 1055lm, 6500K, cool white, BA13-01223 Universal and efficient LED lamp from Braytron with E27 base, 12W wattage and delivering 1055lm(lumens). It offers cool white lighting suitable for office areas. Non-dimmable. Instant start. No flicker. Energy class A+. For indoor use only IP20. LED (light emitting diodes) lamps are energy-saving and ecologically friendly lighting sources which have a variety of applications and can be used in many diverse ways such as garden decorating, interior and exterior lighting, industrial and office lighting, etc. LED bulbs have much more advantages and bring many benefits such as cost savings, long lifespan and efficiency and are incomparably more effective and cheap than the normal heating spiral lamps. LED lighting solutions are usually preferred and extremely convenient where solar powered systems are implemented. The main advantages of LED bulbs and spotlights are their power-saving consumption, longer life, cold and hot temperature resistance and are easy for dimming and control. Those qualities are of a high importance especially when LED bulbs or tubes are used for outdoor/indoor decoration or in places where a certain light effects are needed.The investment in such type of illumination is more than rational and pays off completely soon after its implementation. VIKIWAT wishes you to have a pleasant shopping!